We asked Ola’s Kool Kitchen who presents a show across several independent radio stations to re-evaluate Archive. As a radio broadcaster of six years standing, Ola’s Kool Kitchen on Radio 23, Rock XS Radio, Magic Monster, and KCLA 99.3 FM in Los Angeles was created to combat the myopic mediocrity present in mainstream media. The show features an eclectic mix of genres, while Ola travels the world both recording and playing lesser known new talent as well as established musicians. Put simply, good music has no boundaries. The origins of the band date back to the early 90s; the first album, Londinium was released in 1996. With a similar feel to fellow contemporaries Portishead and Massive Attack, Londinium contained a mix of dark trip hop and electronic- break-beat fused with baroque string orchestration and song writing with a classical flair. There was modest critical acclaim, the band broke up and then reformed with core members Darius Keeler and Danny Griffith. Following a dizzying amount of line-up changes, Archive officially became a collective in 2005, their sound evolving into a psych-electro which harboured elements of prog, post-rock and avant-garde/experimental pop. Archive played many sold out gigs and Festivals across Europe, with songs off their 2009 album, Controlling Crowds I-III, reaching number one in the French and Greek charts, number two in Switzerland and number 5 in Luxembourg. Popular across the continent, including Poland and Germany, Archive seemed neglected by the UK press and public. Despite being a London based band, they rarely played in the capital. The latest album Axiom, as ‘Smiley’ explained to me, inspired someone to create a film using the entirety of the album as a soundtrack. It was featured at the Sundance Festival a few weeks before the band performed Axiom live alongside the silver screen version in London. Upon arriving at the Roundhouse for the gig, I noticed the foreign accents in the queue. London is filled with European visitors and there was a healthy turn out from the continent. The show beginning at 8:30 pm, no support was necessary, with Archive providing just over two hours of music that didn’t feel consistently like the same act. There was a wide array of characters on stage, in total nine band members with interchanging male and female vocals; people doubling up on percussion, keyboards and guitar when needed. 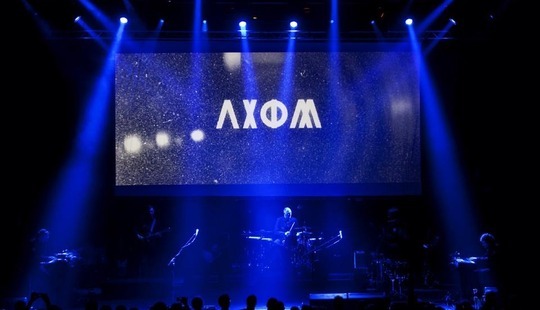 The first half of the show was devoted to Axiom, a large screen housing the gritty black and white images hovered over the band as they took a backseat to the cinematic overflow. The film was accurately described as representing a dystopian reality echoing 1984 in a review. A big brother like character appeared espousing hopeful wishes from a TV screen, with moody, youth culture type characters posed in existential contemplation looking on. The opening track, ‘Distorted Angels’ draws the listener into an epic, edgy, atmospheric experience underpinned by a compelling sense of disquiet. It’s a stand out song, fervent and threnodial with a superb melody cemented within an electronic pop ballad. Reminiscent of the days when silent pictures had musicians provide a live soundtrack, you could lose yourself in the anachronistic surroundings and caliginous sonic backdrop. There were some off-kilter, ornamented musical diversions that were intoxicating, and the signature Archive sound of broad, electronic touches flourishing through-out. The realization of Axiom was a definite highlight of the show. The second half of the gig was the greatest hits of Archive, breaking the melancholic spell and morphing into to their version of pop and dance. Here is where I realized a possible reason the UK has not so easily embraced the band. Their repertoire is truly eclectic, sometimes bordering on schizophrenic. Even though their sound has elements of post-rock, like Mogwai and Explosions in The Sky, or of trip hop like Portishead and Massive Attack, it fails to adhere to any one style, veering through many genres. Its’ lack of a clear musical identity may have confounded a British music press that enjoys the neat pigeon-holing of a band in a distinct category. The audiences in Europe appear to have a different musical sensibility, as ‘Smiley’ explained. Playing large festivals on the continent, he was often struck by how few bands he recognized in the line up, perhaps only seeing two or three that were big names at home. The continent seeming to have less of a need to define the sound, perhaps a totally new genre is required to explain Archive to a UK audience, a post-trip–electro-prog-rock, if you will. The success of the Roundhouse gig points to a possible change in the hearts and minds of the British audience. The venue was full and the audience very appreciative. Talk is afoot of recreating that experience on tour abroad and including more UK dates in the future. Perhaps, the concept of Axiom and the cinematic beauty behind the performance provided a cohesive draw that UK audiences could finally respond to. If you’d like to hear my interview with Steve ‘Smiley Barnard discussing Archive further. Ola's Kool Kitchen can be found here and you can listen to the radio show here.